One of the most rewarding aspects of Film Studies is to be found in recognising how films produced at one, quite distant moment in time often made long ago, continue to influence more contemporary films with which we might all be more familiar. This is certainly true of the impact of some examples of German cinema produced in the 1920s. If you watch Edward Scissorhands (1990), Bram Stoker’s Dracula (1992), Bringing out the Dead (1999) Pan’s Labyrinth (2006) or Shutter Island (2010) you might be able to identify moments where the influence of German cinema is at work. Before we explore three key film texts let’s sketch out a sense of the German cinema industry during the 1920s. In 1914, the German film industry was relatively small, compared to the film industries of America and France for example. The German government supported the emerging film business in order to challenge the impact of imported films and to support Germany’s propaganda effort. Key to this ‘early’ period was the aesthetic of Expressionism, a mode that has subsequently had a profound impact particularly on the film genres of horror and science fiction. The three films we’ll refer to in this resource offer perhaps the most famous and accessible examples of the Expressionist aesthetic in the context of movies. 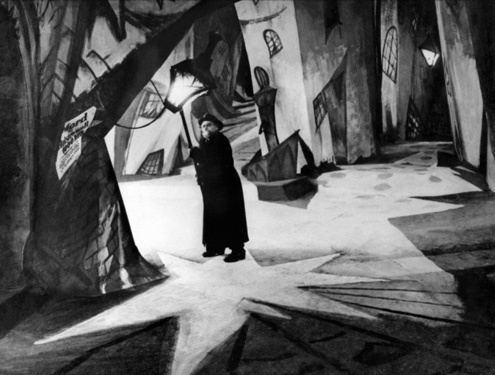 Other films that have also defined our sense of German cinema’s engagement with Expressionism have included the titles Waxworks (Leo Birinsky & Paul Leni, 1924) and Die Nibelungen (Lang, 1924).